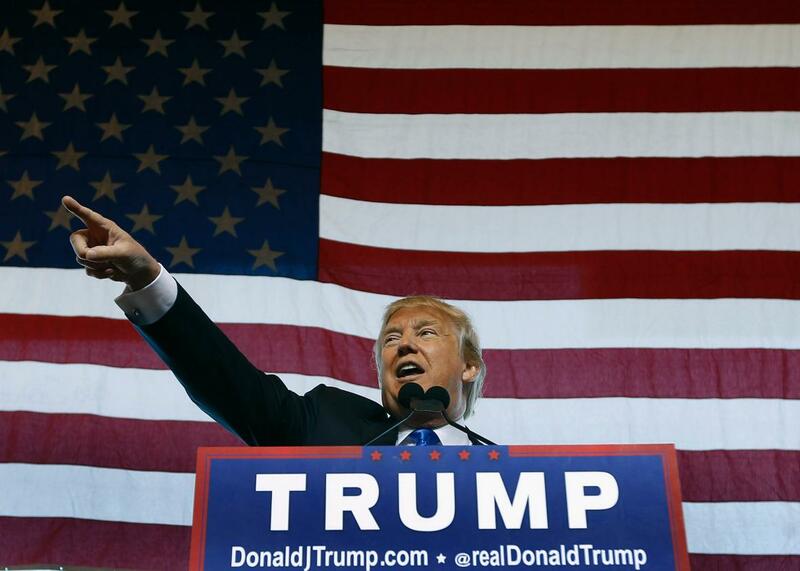 What happens if Donald Trump actually wins New Hampshire? Donald Trump speaks at a campaign event on Dec. 16, 2015, in Mesa, Arizona. With a little more than a month to go until New Hampshire, the GOP establishment is desperate to derail Donald Trump. The Granite State has always been integral to the GOP Empire’s hopes of striking back after the unfriendly terrain of Iowa, where this year conservative caucusgoers appear set to decide between Ted Cruz, a candidate the establishment hates, and Trump, a candidate the establishment really hates. A strong second-place showing by Marco Rubio, Jeb Bush, or Chris Christie in New Hampshire on Feb. 9 would be welcome news to party power brokers eager for donors and Trump-haters to finally rally around a candidate they could live with, but it won’t change the fact that a Trump win would legitimize his candidacy in ways that his polling performances and crowd sizes have been unable to—and that even an Iowa victory, in the less likely event it happens, would not. If Trump wins New Hampshire, in one fell swoop, he will have bested the best the Republican establishment has to offer in a state where they’d have no excuses given primary voters there are considerably more moderate and establishment-minded than Iowa’s GOP caucusgoers. The status quo clearly favors Trump: In the latest RealClearPolitics rolling average of surveys in the state, Trump sits in first at 26.3 percent with nearly twice the support of Rubio, his closest challenger. New Hampshire voters still have plenty of time to change their minds—but they have been far from fickle to date. The Donald’s held a double-digit lead in the state for five months and counting, and has topped each and every one of the past 30 RCP-tracked polls. There are reasons to suspect Trump’s current polling support won’t fully translate into votes, but he does have a double-digit cushion to work with in the event some voters have second thoughts when it comes time to pull the lever. Meanwhile, if Trump’s establishment rivals can’t give his fans a reason to change their minds—and it appears they’re no longer even trying, instead content to fight with each other for the runner-up slot in the second contest of the year—they’ll have to hope enough of them simply stay home instead. That could ultimately happen, but it’s hard to overstate just how much the GOP race would be turned upside down if it doesn’t. Today, it’s possible to believe that Trump will, as Ezra Klein put it this week, simply “lead until he doesn’t,” and that we don’t need to know exactly what will spell Trump’s ultimate downfall to think that’s what will eventually come to pass. But it would become considerably more difficult for politicos and pundits to convince themselves of that outcome if they wake up on Feb. 10 and Trump has gone from polling front-runner to real-life winner of a state where primary voters have backed the past two GOP nominees and four of the past six in contests without an incumbent. If you think Trump’s getting too much free media now, just imagine the 24-Trump coverage that would follow a victory in New Hampshire. Meanwhile, the primary calendar would provide Trump with the chance to ride his momentum into the next two contests, South Carolina and Nevada, where he currently leads Cruz by double-digits and his closest establishment rival by 20-plus points. In the past six GOP primaries without an incumbent, New Hampshire and South Carolina have been won by the same candidate three times—and all three went on to win the nomination. I’m getting ahead of myself, of course. Plenty will happen between now and New Hampshire next month, and even more between now and the Republican National Convention in Ohio this summer. In the near-term, Trump’s campaign could collapse along with his ego if Iowa voters brand him a “loser” and undermine his I’m-a-winner-because-I-win pitch. Or the GOP establishment could finally rally around a single candidate as its been expected (but so far unable) to do since the beginning. And even if Trump does win New Hampshire, it doesn’t mean he’ll win the nomination. He’d still face a serious challenge from Cruz in the Southern states that dominate Super Tuesday, and the Republican calendar is back-loaded with big, winner-take-all Northeastern states that will favor whichever establishment candidate is still on his feet then, unless they’ve all done such considerable damage to each other while trying to stay alive. But with less than five weeks to go until New Hampshire, it’s worth remembering that if the current dynamic holds, there will be two stories emerging in the wake of the first-in-the-nation GOP primary: One about the establishment’s newly anointed savior—and one about the man who just beat him on establishment-friendly territory. It’s not hard to see which will get top billing, or which candidate will emerge with the momentum.